iGrafx is a collaborative process management suite that enables companies and organizations to improve their productivity in terms of business process information. 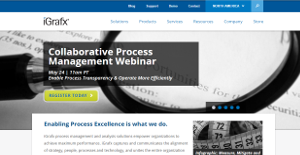 This web-based process management platform is built to improve, simplify, and streamline the development, documentation, and management of business processes and converts all its related information into reusable knowledge, which in turn, speeds up the delivery of projects while providing transparency and understanding across the organization. With iGrafx, managing and governing process knowledge becomes centralized and simplified, improving overall operational efficiency. You can select the methodology that suits your business needs, particularly your process practitioners, to create processes that produce tangible results. Rapid deployment and management of automated business processes improve the accuracy and efficiency of your operations. You also have total visibility and control over the processes to ensure that they run based on your requirements, specifications, changing environments, etc. iGrafx gives you a web-based platform to capture, centralize, and share processes knowledge, resulting in effective collaboration. The software makes it simple to access process capture and discovery. With iGrafx, users are able to get the most out of their diagrams and leverage fast process capture by way of user-friendly construction guides. Access to real-time information is everything and with iGrafx, users always see the most current data and control how this data is viewed and shared. Performance is greatly optimized and access is made flexible, both of which promote absolute web-based visual transparency. That said, you have control over who has access to what, meaning you can keep sensitive data out of reach from groups or individuals with no permissions. iGrafx automatically builds and finds historical process documentation while at the same time, takes out naming conventions to keep prior versions. You can place current versions with their historical counterparts to see and comprehendexactly what has changed. By associating roles and responsibilities to a critical process content, you can quickly find relevant documents in your personalized portal based on your role or your permissions. Maintaining and leveraging libraries of organizations or roles to use as Swimlanes becomes a breeze as well. If you are interested in iGrafx it could also be beneficial to analyze other subcategories of Best Business Process Management Software collected in our base of B2B software reviews. There are well-liked and widely used systems in each software category. But are they automatically the best fit for your enterprise’s specific needs? A market-leading software product may have thousands of subscribers, but does it present what you require? For this reason, do not blindly spend on popular systems. Read at least a few iGrafx reviews and mull over the aspects that you want in the software such as the price, main features, available integrations etc. Then, shortlist a few solutions that fit your wants. Try out the free trials of these platforms, read online comments, get explanations from the seller, and do your homework thoroughly. This profound groundwork is certain to aid you find the finest software solution for your company’s unique needs. How Much Does iGrafx Cost? Since customer objectives and needs may vary, iGrafx pricing is scalable to support single user desktop installations, team collaboration, and enterprise on-premise, as well as cloud, hosted subscription-based models. Give the vendor a call and let them put together a package that matches your goals. We realize that when you make a decision to buy Business Process Management Software it’s important not only to see how experts evaluate it in their reviews, but also to find out if the real people and companies that buy it are actually satisfied with the product. That’s why we’ve created our behavior-based Customer Satisfaction Algorithm™ that gathers customer reviews, comments and iGrafx reviews across a wide range of social media sites. The data is then presented in an easy to digest form showing how many people had positive and negative experience with iGrafx. With that information at hand you should be equipped to make an informed buying decision that you won’t regret. What are iGrafx pricing details? What integrations are available for iGrafx? iGrafx provides integrations to SAP, exports to BPMN, XML, XPDL, HTML, Java, Word, PDF, EXL, PPT, as well as several graphical formats. Via their REST API component, connections can be made to numerous systems of record for the import / export of data. Pros: iGrafx has been excellent for capturing and documenting our current processes. It has virtually no learning curve. I was able to watch the short tutorials on their website and was up and running. Cons: I have not experienced any problems with this application. Everything words as or better than expected. Pros: The ability to quickly create a process and ensure that it is shared with any others in the organization that need access is web based and very easy to start. Cons: We did not have any problems. The rollout is subscription based and required little to no IT project resources on our side. The ability to quickly create a process and ensure that it is shared with any others in the organization that need access is web based and very easy to start. If you need more information about iGrafx or you simply have a question let us know what you need and we’ll forward your request directly to the vendor.